The EU leaders have apparently taken the stance on the Greece economy that Syriza would be unlikely to Grexit, but if they did, the EU would weather that event without too much trouble. However, I believe that a Grexit would prove to be the beginning of the end for the Euro and the EU as we know it. In the event that Greece reneged on its sovereign debt, the IMF, ECB, several governments and major banks would incur losses on the Greek loans. There would also be very substantial losses related to several trillion Euros of financial derivative bets underlying that Greek debt, not to mention the loss in value to and of the Greece economy. The chances are reasonably high that the financial markets would become increasingly nervous about the other financially weak Eurozone countries (often referred to as the PIIGS) which could well create a fresh bank crisis triggering Phase 2 of the 2008 financial/economic crisis. Ambrose Evans-Pritchard observed and wrote in the Telegraph newspaper, that an exit of the Greece economy from the Euro would “eviscerate the EU Project as a motivating ideology in Europe”. If, as Ambrose reports, Jean-Claude Juncker is fully aware of the risks of a Grexit, it does not appear to have resulted in a modified EU stance towards Greece. I would suggest that perhaps Jean-Claude Juncker underestimates the financial ramifications of a Grexit in the event that Greece reneges on its sovereign debts. Remain in the Euro and accept the current status quo with the EU and Troika. 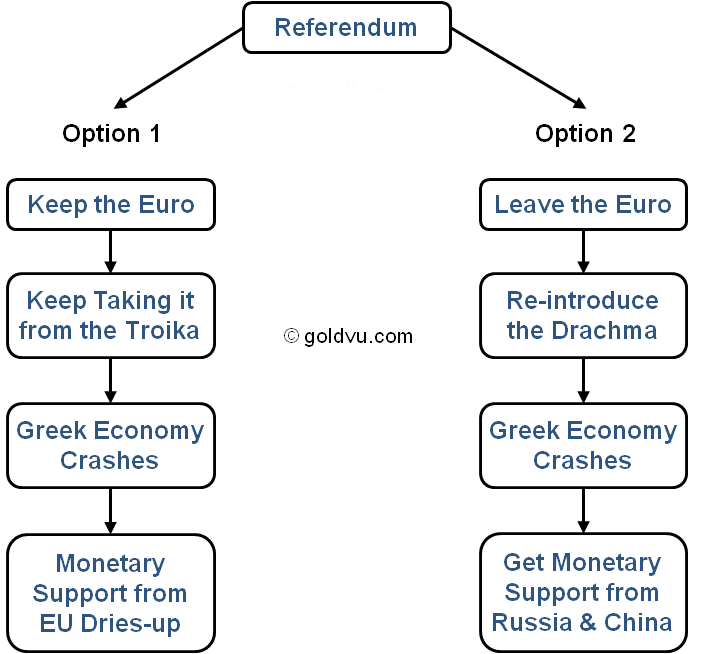 Exit the Euro and re-introduce the Drachma and pivot east to Russia/China. Syriza can, and should, declare a 'bank holiday' including the introduction of capital controls, along the same lines as implemented in Cyprus, so as to stabilize the Greece economy & bank deposits and halt the flight of funds to other countries. Such action should buy some breathing space in which Syriza can arrange a national referendum, and any demands from the EU/Troika for Greece to implement a bank bail-in should be resisted until the results of such a referendum are known. The situation which Syriza inherited, makes it next to impossible, at this point in time, to downsize the bloated government civil service, bearing in mind the huge unemployment already created by the austerity measures. However, that and other issues can be addressed post referendum, as part of a well planned, cohesive and comprehensive root and branch reform of the government infrastructure and environment of the Greece economy. Plan B - Time to Pivot East? The very aggressive stance adopted Tsipras and Varoufakis gives me the distinct impression that they have a plan B to fall back on, i.e. a Greek pivot to the East, with practical and financial assistance from Russia and China, who geopolitically, would have a great deal to gain by having Greece come into their Eurasian bloc. The Russians and Chinese are no doubt very alive to the military and geopolitical sensitivities of a potential Greek pivot to the East, and as a result the information divulged at any press conferences held after meetings with Greek politicians will be low key with no contentious content. I would be very surprised indeed if Putin/Xi hadn't privately outlined the manner and full extent of any financial and economic support that would be forthcoming to the Greece economy in the event of a Grexit, and a Greek pivot towards the East. 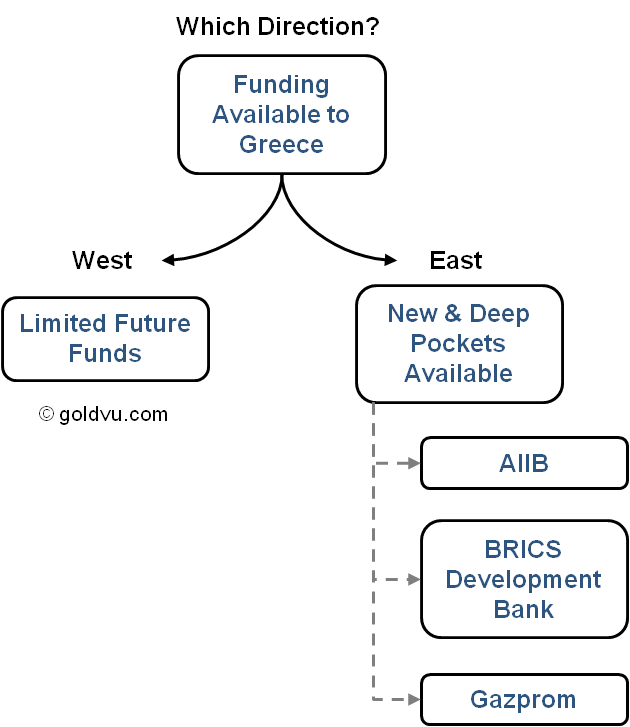 Under such circumstances, Greece would most likely become eligible to apply for funding from the AIIB and BRICS Development Bank for assistance in key infrastructure and economic development projects. It has recently been reported that Russia's Gazprom anticipates that the agreed gas pipeline to be built through Greece will be completed in 2019, and as a gesture of good faith, Gazprom may be prepared to advance the Greek Government between €3 Billion and €5 Billion against future gas pipeline revenues. It has also been reported that Russia will shortly lift its ban on the import of agricultural products from Greece, Cyprus and Hungary and that Russian food and health inspectors are inspecting several agricultural exporters in those countries prior to issuing permits to export produce to Russia. The EU sanctions against Russia expire during June 2015 and will lapse unless all the EU countries vote to extend the sanctions for a further period of time. If so, it would definitely be in Russia's interests to ensure that the Greece economy has sufficient cash to ensure that it is in a position to remain in the EU at least until the end of Jun 2015 so that it is in a position to vote. It would therefore seem logical that the quid pro quo for Gazprom providing Greece with the aforementioned advance on the gas pipeline revenues, would be a clear understanding with Syriza that they would veto any extension of these sanctions against Russia. If those funds are indeed provided by Gazprom, it should buy the Greek Government some breathing space, but not much, as it has monthly salaries and pension payments of approx. €1.7 Billion, as well as loan interest and principal repayment commitments of €3.7 Billion between now and the end of June. It should be borne in mind, that in the event of a Grexit, Syriza will most likely renege on all its EU/IMF debts, and as such it will not have that unsustainable burden to carry, but it would undoubtedly have to cope with many difficult issues including stabilising a rapid devaluation of the new Drachma and a high inflation rate, as well as conducting a root and branch reform of the Greek civil service, introduce effective tax to halt the fall of the Greece economy and even turn it around. In truth, at present, I empathise with Syriza's predicament, as it has been given a mandate to pursue two tasks which are in essence mutually exclusive, ergo, remain within the Eurozone and reduce/end austerity measures. Tsipras and Syriza will need to seek a fresh mandate from the Greek people and commit Greece to a firm course of action by the end of June 2015. The next couple of months should prove very interesting, and will have ramifications far beyond the borders of Greece. A Gexit and/or a default in Greek debt will have very bullish implications for both gold and silver. To see the secrets and numbers you aren't being told of Greece leaving the Euro and its impact on global finance, you should read To Grexit or Not To Grexit?